In an echo of the past, I bound off the sweater I was working on during Wonderwool and the first yarn I pulled out of my purchases was the linen. Like last year. And the year before. This is just further evidence of my weird OCD quirks, isn't it? 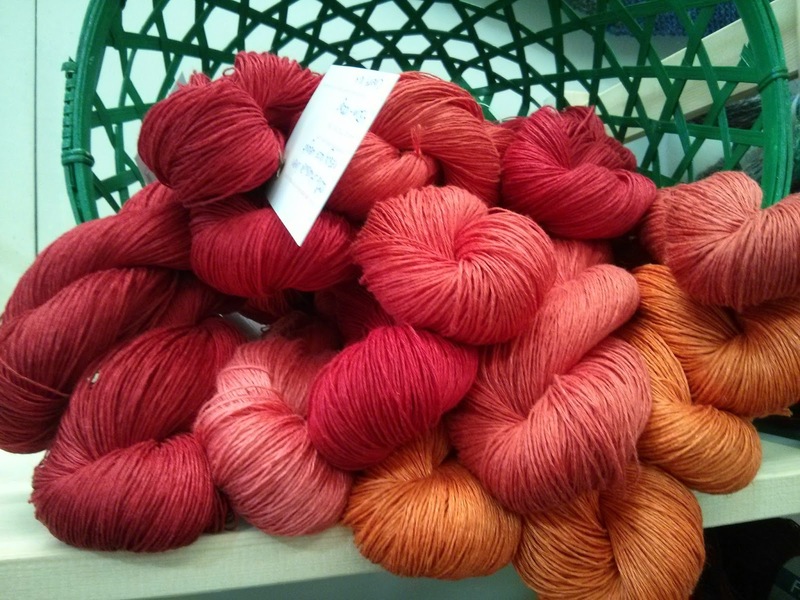 Oh, how tempting it looked on the Midwinter Yarns stall! It was a Sunday morning purchase - one coral, one glow, two cherry. I planned a colour phasing top. I decided I would make up my own pattern but prevaricated, not wanting to mess it up. Then a good pattern came up in the latest Interweave so I went for that one, even though I'm on tiny needles and still not getting gauge. This was my progress as of Sunday afternoon. I was onto the second stripe and had realised much too late that just dividing the length of the top by the number of stripes was not going to be a recipe for success, as I'd used almost half the Glow and I was only done with the first of three stripes of it. The detailing looks so good in the linen, though. I did not regret my choice of pattern for even a moment. So, I switched to the all-glow stripe a bit early and realised after two inches that I was going to be lucky to get one all-glow four inch stripe out of it, let alone one all-glow four inch stripe and one glow-cherry four inch stripe. If I was one of those proper knitters I would rip right back and make my stripes three inches, but I'm not. I'm afraid if I rip it back I will become so annoyed with it that I won't knit it up again. Like, it will go in the sulky basket, like Breeze on a Sea Air that I loved so much and never finished*. And I like it too much for that to happen. And, as Mr Z pointed out by asking the right question, I don't know if I would have enough yarn for three inch stripes, even. That is going to be it for the all-glow stripe. I have started on a glow+cherry stripe. I think maybe if it is half as wide as the all-glow stripe, and then I switch to the cherry for the rest of the top, it won't look too weird. 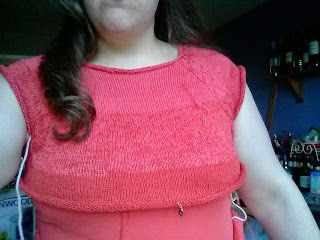 I had already planned to do the neck and armhole edging in the red anyway, to tie it all together. Someone on Ravelry asked if the stripes need to be the same width, which of course they don't, but I had an idea in my head of how it would look, yknow? It's going to take time to readjust that mental image. What I really don't want is for it to be really obvious that I ran out of yarn. On the plus side, it fits. Considering I wasn't getting gauge, went down a size from what I'd normally knit, and then started getting gauge (of course), this is a triumph in itself. * Spoiler alert - I did get this out the other day and I'm going to begin working on it again when I'm finished with the linen. In other news, of that FOs post, I only finished three of that seven.